The library aims to provide a well-focused resource of literature and other materials supporting training, research and policy developments in values-based practice. The library depends on everyone submitting content – this is why it is a wikiVBP library – see the section How to Submit Content below. If you are searching for a particular item that is relevant to your interests but don’t have an author or title, you can either enter a search term such as ‘Philosophy of Science’ in the search bar, or you can click on the Tags menu (top right of the home screen) for a drop down list – clicking on one of these tags, for example ‘clinical reasoning’, will bring up all items that have been labelled with that tag. You can also enter a tag search term in the search bar on the tag list to save scrolling through the whole list. Please check you have copyright permission (through your library or otherwise) for any use you make of items accessed through this resource. 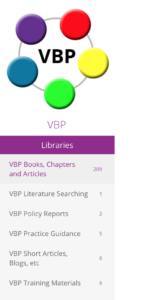 We have set up the wikiVBP Library because the standard electronic databases are not structured to allow easy retrieval of values-related literature (see the section on VBP Literature Searching). We have called it the wikiVBP library because its success depends on all of us submitting content. The main criterion for including an item in the library is its relevance to values-based practice. This is particularly important if the library is to serve its purpose as a well-focused resource supporting developments in the field. We would normally be looking also at criteria such as originality, comprehensibility and rigour (for example as indicated by publication in a peer reviewed journal in the case of a research report).